Benzoyl peroxide, a.k.a. the Acne Killing King. 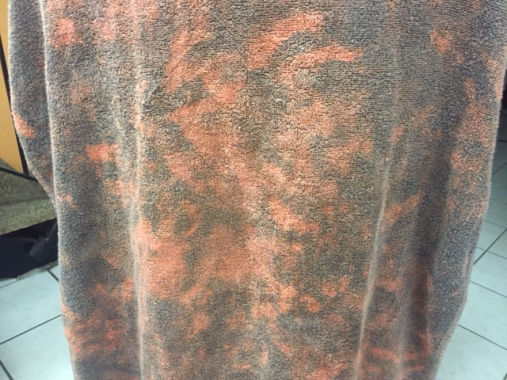 And uh, the thing that leaves your towel and pillow cases looking like this…. Sigh, it’s true. This acne killing machine does unfortunately bleach fabric if you aren’t careful. As an aside, benzoyl peroxide resistant towels and sheets can be found at your local target (check the dorm section). Them college breakouts though…..
Today we’ll be discussing all the things science and benzoyl peroxide. Make sure to stick around for the secret tips on how to reduce its irritation. It’s the second most prescribed acne medication in the United States (given in 12.8% of all cases), (8) and can be found over the counter in concentrations ranging from 2.5% to 10%. Pro-tip: use 2.5%. Studies have shown it’s as effective as 10% with less irritation. In my humble opinion, it is the most effective treatment against acne (besides accutane). It’s actually what kept my skin clear during my teen years. Its efficacy has been proven in studies that show benzoyl peroxide reduces P. acnes (i.e. acne causing bacteria) by up to 97.5% in just 5 days. (9) This is absolutely astonishing in comparison to most other acne treatments. This potency however, doesn’t come without its share of downsides. And while it doesn’t cause bacterial resistance, it can seriously damage the moisture barrier and acid mantle, which could in turn disrupt the skin flora causing all kinds of problems like seborrheic dermatitis or malassezia folliculitis. 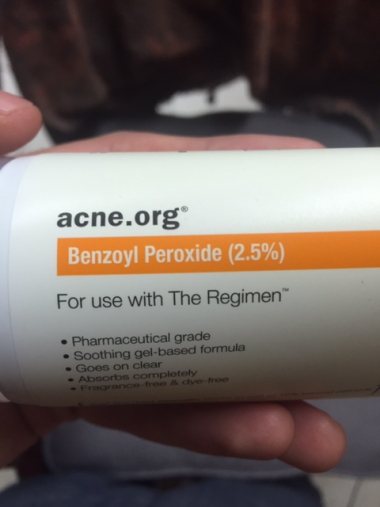 How to Reduce Benzoyl Peroxide Irritation. 1. Buffer it with a moisturizer. In other words, apply your moisturizer first and then layer Benzoyl Peroxide on top of it. This only slightly decreases its effectiveness, and helps reduce redness and dry skin. 2. Short contact therapy (my personal favorite). Generally, when people use benzoyl peroxide they leave it on overnight or throughout the entire day, which could unfortunately cause irritation. Doing this might be unnecessary altogether. One study examined the effectiveness of washing off benzoyl peroxide after a two minute application. (12) The researchers ended up ruling that it was “highly effective in reducing the quantity of P. acnes,” and comparable to a “leave on” 5% benzoyl peroxide product. Best of all, it didn’t irritate the skin! If I’m having a breakout, I like to do this in the morning before cleansing. I simply apply the Acne.org 2.5% Benzoyl Peroxide Gel, let it sit for about 5-10 minutes or until it dries, and wash it off with my morning cleanser. I’ve yet to experience any irritation doing this, and it seems to work as fine as leaving the product on. 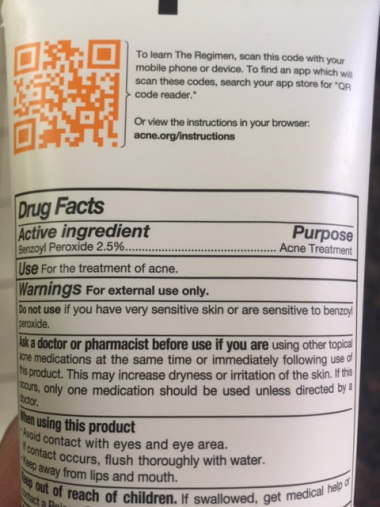 UPDATE 7/12/17: Another great option is the Dr. Song 2.5% Benzoyl Peroxide Lotion. Alrighty. That does it for Benzoyl Peroxide, folks. Hope you’ve enjoyed this! Save your poor friends from unnecessarily irritating their faces with BP. Share this! My wife and i felt now happy when Ervin could finish off his reports from your precious recommendations he got from your web site. It is now and again perplexing to just happen to be giving for free secrets and techniques other people may have been trying to sell. and it is facilitating our son and our family reckon that the subject matter is satisfying, which is wonderfully fundamental. I read a study recently that found benzoyl peroxide wash to be very effective in reducing acne. I’ve consistently used OxyMax 10% Benzoyl Peroxide Wash and I’m wondering if I should switch cleansers? The wash is very gentle and has helped with my acne. Hi fc, I’ve read somewhere that incorporating AHA/BHA into their regimen broke them out severely and I’m afraid it could do the same for my skin (here’s the thread: https://www.reddit.com/r/AsianBeauty/comments/405oin/warning_unpleasant_acne_pictures_chemical/). But I battle with closed comedones now on my forehead and right cheek (nothing serious, but kinda looks ugly under makeup, and naturally more obvious!). What do you think is the best way to reduce the possibility of worsening my skin as a result of AHA/BHA overexfoliation? I read from one your writeups to introduce one product at a time. What do you think I get first for my closed comedones the AHA or the BHA? Thanks! I am living overseas, is there any other substitutes of acne.org bp? Cause amazon wont ship this product to my country, thanks a lot! Where would I add a full BP facial application? Thanks for your help. I started the regimen in early February and stopped after 2 and a half weeks because I couldn’t take the dry, flaky, lizard skin. I really wanted to push through but I just couldn’t handle it. My friends were asking what was wrong with my face. So after about 5 days of not using it my skin went back to normal thank God! Anyway I am now going to start over and put the BP on first thing in the morning, let it dry and then wash it in the shower and then put on my moisturizer. I don’t like The Regimen moisturizer and I tried Cerave cream and cerave moisturizing lotion but the cream is too heavy and the lotion I think broke me out a little but who knows if that’s the real culprit. I do like the Cerave PM and do you think it’s okay to use that in AM and PM? I don’t see why not but just figured I’d ask. Also, do you use AHA? when do you think would be safe to start using that and if you do use it, when in your regimen do you put it on? Hey again! I left a comment earlier, and I’ve been on your blog legit the last hour or so. Okay, I think I’m going to give contact therapy a shot with the BP, and replace my acne.org moisturizer with the ELTA MD therapy one. Maybe I’ll start putting it over my moisturizer a few nights. And I will probably invest in a vitamin C serum down the road. Just want to say THANK YOU for this blog, it’s so nice to learn from someone who’s been on The Regimen with BP, and have some other solutions to keep it clear without the excessive flakiness I get from constant BP. i tried using the acne.org bp for a few days and i only used a pea sized amount as instructed. i only used it every other day and it cleared active pimples but until now my face is irritated, red and scaly. I dont know if this is an allergic reaction or eczema as get eczema once or twice a year. Im going to try the short contact therapy once the irritation is gone!. How much bp do you use everytime? do you use a finger length or did you apply less the first week? im also wondering if you wash your face with a cleaser first, apply bp then wash again with a cleanser or do you just apply bp before cleansing?? thank you so much in advance!!!! Hi there, just discovered this tip on your blog. I’m still using Sebamed and the credentials glycolic lotion. My skin is better overall but still generating white heads and some blackheads (especially in this super hot weather). It’s the worst when a whitehead pops up during the work day, then when I stop into the bathroom, I realize my co-workers had to have noticed the bugger on my face. So embarrassing. Anyway, I have a 5% BP that has a fairly simple formula, is it ok to use that for contact therapy for a couple minutes, or too harsh? Also, do you rinse it off with water first, or just apply cleanser directly over it and then rinse it all off? thanks! Hi, I am loving your website! So much amazingly detailed eye-opening information! My question is regarding the BP short-contact therapy, would it be better or worse (effective wise and irritation wise) to use a BP cleanser and let it sit on the skin for a few minutes, as compared to using a BP gel in the way you are doing? I want the least irritating & most effective way. Interesting that you recommend applying BP after moisturizer to reduce irritation effects as opposed to applying moisturizer after BP to counter the irritation. Was it because applying moisturizer after BP is less effective in hydrating? Thanks! P.S. your site info is very informative and i like very much the portion of product reviews where you advise on where the product is used in the sequence along with other products, very useful info which alot of site reviews they dont really tell you. Is the exfoliating properties of BP enough for exfoliation or should a scrub or chemical exfoliant be added to my routine? I am now using both Mad Hippie and BP and following your sample routine, that is using the BP as the last, after Mad Hippie and Moisturizer. I read that one should not use both Vit C and BP products in same routine, something about render both ineffective. Should I take note of that? Thanks! But i have a problem. I have normal whiteheads and deep&painful pimples. whiteheads cleared up for the first 3-4 days or so and one morning, bam! i got seven pimples. also i feel the bumps under my skin when i massage with my oil cleanser. can those pimples appear because my cycstic acne decided to come to head? It’s been 3 weeks and i still get acne. from my understanding BP does not cause purging. And they always say you should keep getting acne on BP. so i think it’s just not working for me. My derma told me to use these for 2 months and come back later. Do you think it’s worth keep using it? Am i wasting my time? Ugh i am sorry i made so many typos and mistakes. It’s my 3rd language but I sware i can English. 🙁 i meant i ”can’t” tell how much i appreciate your advices. And at the last paragraph i meant they always say you should ”not” keep getting acne on BP. First of all, your blog is amazing! I too use the short contact therapy and do moisturizer first strategy. I use short contact therapy when I have time and at home. If I’m out camping I do moisturizer and then spot treatment only with benzoyl peroxide. Your posts are really helpful. Thank you very much! I just have a quick question, when using benzoyl peroxide wash, does it still stain your clothes? I want to use it to treat my back acne, but worried that it could ruin my clothes. Keep in mind when reading clinical studies the type of BP they are using. Prescription BP is soluble and not milled like OTC brands. It’s a complicated and more expensive processing method. Soluble BP completely enters the pore and surrounding tissue unlike milled versions which leave hit spots of BP crystals.